A simple way of setting the table. My group mates took the dinner plates to our food on it so I didn’t have it here on the picture. They were nice plates (with bamboo drawings). To be unique from other groups, I folded our group’s napkins into a “bird of paradise.” In the end, the other groups started folding their napkins, too, because James (from one group) knew how to make a clam shell fold and a crown fold. 3 other groups folded their napkins that way. Today was our last Lab day in Home Economics: Food Prep class. This time, the lab was about making a time schedule of what time we will finish preparing/cooking/baking a certain food. 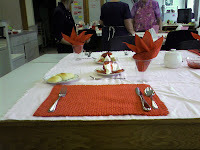 Each group made 4 kinds… the veggies (which was easy and was assigned to me so I can set the table), the chicken roll up, cheesecake, and the bread. Each time someone was waiting for their assigned food to finish baking or steaming or anything, they helped out with a member of their group who needed help. However, I didn’t get one when I was setting the table because all of my group mates were busy helping each other with the food. We had 1 hour and 30 minutes to prepare everything and by 2:45, we had to be seated in our table already with the food in our plates (well-presented). 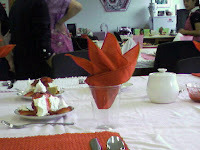 Everybody was following the book when they were setting the table, including myself. Our teacher said we don’t have to cover our whole table with tablecloth because none of her tablecloths will fit anyway so I left it as it was even though I wanted the tablecloth to hang down a little bit at the edge. But it seemed to me that our table was “pale” (I don’t know how else to put it) so I folded our napkins into something I learned from PCC. At first I made a water lily fold which didn’t really look good because we didn’t use any thing that would require to be put upside down on top of a napkin anyway. So I tried the fan fold but I still have to train myself more with it. Then I tried the crown fold but the napkins weren’t standing firmly because the napkins were too soft. I tried candlestick fold but the napkins were too big for the plastic cups… so my last resolve was the bird of paradise… the picture I got is the worst looking one, though. It looked like something else.. hehehe. there’s a dead fishy in the bowl..
Last Friday, April 04, 2008, Jesse and I went to the Winter Ball. I really had fun even though I had to wait for 70 minutes for Jesse to finish with the job they “told” him to do that night. And even though my feet were sore, we still danced the night away and had tons of fun. There were only finger foods which were just enough to fill up my tummy, but I wasn’t really hungry. I just wanted to enjoy the night with my wonderful date, my fiance, and make sure that he is also having a good time. We boarded the ship around 10:40 pm – about the time the ship was leaving the dock. We cruised around Diamond Head and I enjoyed the night sky away from the island even for a few hours. It was my first time to be in a cruise ship, with a date that I really really really REALLY admire so it was really a very wonderful night for me. Yesterday, we bought Chicken Bacon Ranch (in my case, Chicken Bacon Honey Mustard… hehehe) sandwiches at Subway. Then we drove to Laie point and ate our yummy sandwiches there. We talked about few random stories, then it went to the “Are You Smarter than a 5th Grader” video that I saw – which then led our conversation to a spelling contest. I initiated it, but he also started asking me to spell some words like mitochondria, marine corps (he thought I won’t spell the corps right), and some other stuff. Some of the words he made me spell were quite simple, but others that I haven’t heard of were a bit of a challenge to me . The greatest hit that I guess he made me spell was supercalifragilisticexpialidocious. He probably thought I wouldn’t be able to spell it. But I wasn’t able to spell potpurri (i thought it was paupery), and some other words I can’t remember. I thought I’d deceive him when I asked him to spell receive. But he spelled it right. He even told me about the rule, “i before e except after c” so I made him spell seize. It was fun to watch him getting confused.. hehe! He got it wrong along with other words, too, like boutonniere and phylum. It was very fun competing with him. Just before I even wrote about our day yesterday just now, Jesse wrestled with me in my hale’s lounge so he could take a look at what I’m writing about. Man, I got so tired. I was able to fight back a little bit but man, his weight is obviously has more advantage than mine… and I can’t even laugh out loud.. and he just did it for a little bit just now again… oh well! I have a playful fiance right here and I love it! You had the most beautiful smile. I’d wake up each day feeling alright. Makes me feel things will work out just fine. I needed someone like you in my life? That there’s an empty space in my heart? You came at the right time in my life! And took all the worries and fears that I had! It’s not everyday that someone like you comes my way.